For several years OMPT has been supplying our partners with the same reliable, affordable and eminently transportable projector. Today, we’re sad to announce that this model is no nger readily available in the United States. To prepare, we here at OMPT have been trying out some new possible replacements. And not only have we been testing new pocket-sized projectors, we have also been looking at offering an alternative projector kit, one with a larger (but still transportable) projector with considerably higher lumens. As we research new possible replacements, we are once again reminded of the incredible rate at which technology improves. Our previous projector, which is only a few years old, is a 50 lumen projector. Now, for a comparable price, new pocket projectors offer 400 or more lumens. This increase in power is incredibly exciting. These new projectors could have a profound impact on our partners’ work. Not only will the increased lumens allow organizations to present to more people, they can also improve the quality of video projections during the day or in locations with a high amount of ambient light. Changing projectors has also forced us to adapt to new power sources. The voltage required to charge different projectors can vary dramatically, so it’s possible we’ll need to adjust the contents of our recharge kits as well. None of us here at OMPT are electrical engineers so attempting to solve this problem has been both challenging and, if you’ll forgive the pun, illuminating. While our last projector has been a reliable, powerful model that’s brought about profound social change, OMPT is excited to enter this new phase. 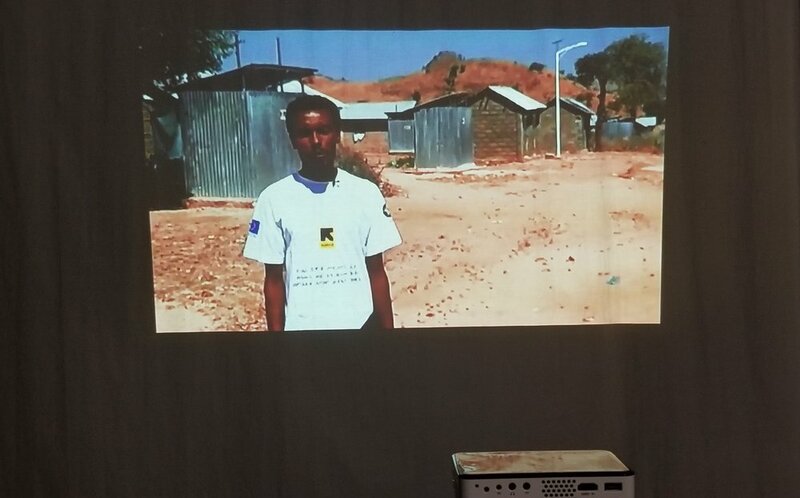 Whichever projector we choose, we know it will allow our partners to be even more effective in bringing education and behavior change to the developing world.